If you’re ever passed by a Gaucho 28, the first thing you’ll probably notice is the light pair of full-size 700C wheels, shod with Continental’s sublime GP4000s – a combination that wouldn’t be out of place on an upmarket conventional racing bike. 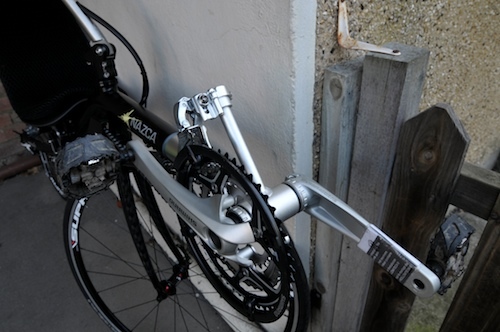 A lovely contoured carbon seat and shiny carbon forks round off a package that includes oh-so-aero reverse-mounted brake calipers and a butted derailleur boom which flares at the end to accommodate a conventional band-on attachment. 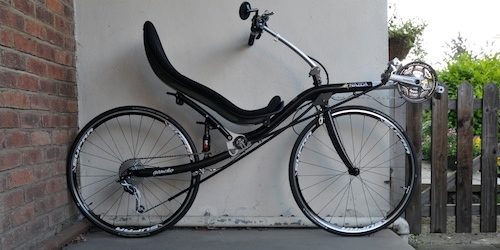 A real racing recumbent, right? However, and I will get this out up front since it’s a bit vexing, for a go-fast bike there are some strange choices. First, the handlebars are a little pedestrian for such a fast ride – contrast them with the arrowhead tiller on the RaptoBike, which allows you to ride with your thumbs touching and elbows in the dirty air behind your thighs. Second, the seat angle. It only goes as low as ~26 degrees, which is quite disappointing coming from a bike that will go below 20. This seems to be a mixed bag in the highracer market – the Challenge Seiran SL doesn’t even go as low as 26 degrees, after all – but there are a few that do go to 20, such as the MetaPhysic, Bacchetta Aero, and M5 CHR. Nazca implicitly acknowledge this, and went so far as to modify a Gaucho for rider Peter Haan to drop the seat angle for a race (article 1, article 2). You can, I’ve learned, order your Gaucho with this reclining mod from the factory, but it’s not something I’d readily attempt on a regular bike, even if you could get the parts (which include a shorter travel shock). And yes, quibble number three – suspension. As it happens I think suspension on a recumbent can be rather a good idea and in the guise of fast tourer or commuter, I’d certainly not turn my nose up at it. 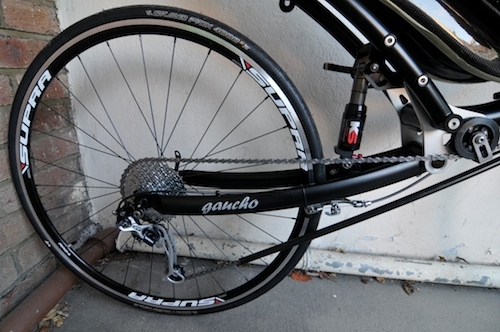 The Gaucho 28 comes with a nice air shock that really takes the edge off our lunar streetscape and more than once I felt my Raptobike was missing the plush ride of the suspended Gaucho as I cratered over a 30cm precipice. Okay – time to reset our expectations and think about the bike as less the all-out racer, more the distance or ultra distance machine, or even 4-season fast commuter. Now we are more comfortable with the relaxed seat angle and the suspension must be welcome to any rider approaching the arrivée with 350 cratered miles pounded into their spine! The wide tiller bar seems more valuable for the practical real estate. Bell, mirrors, cycle computer and/or GPS – even a headcam – will all fit comfortably. At 5’10” (178cm) with short legs for my height, I had no problems getting to the ground on the Gaucho (although lamentably, I cannot stand on my fingers as with the dual 700C RaptoBike!) and I really enjoyed the clearance between heel and front wheel. Although you can certainly strike the wheel, I never felt the need to stop pedalling around any turn, unlike on my Raptobike, where I can kick the derailleur and/or the wheel much more easily. The cost of the most basic Gaucho is a hair under 2200EUR, quite a bit above the Raptobike Midracer, the touring version of which weighs in at 1800EUR. Of course, it’s hard to compare like with like here – you are getting components like the shock, of course – and on the other hand, the Gaucho is way cheaper than racey alternatives like the Seiran SL or M5 (but then they are much lighter and perhaps, significantly faster?). Don’t get me wrong however – the Gaucho is no sloucho (sorry!). In fact, when I took it out for my first test ride, a lumpy 35 miles that formerly made up my commute, it blew my personal best out of the water. Of course, having been training for Paris-Brest-Paris I am also going around with more miles in my legs than I did when I left that job two years ago, so I’d need to do another test run on the other bike for a real comparison – but you get the idea. I also managed a 2h30m half-century (elapsed time, not riding time) which is very respectable as an extended commute. For our friends in Europe, this is ~80km at ~32kph. As it happened, I would have considerably more time to ponder this review than I initially suspected. As I wrote on my account of the 600km Edinburgh-Preston PBP qualifier, my knees have been giving me quite a lot of trouble. 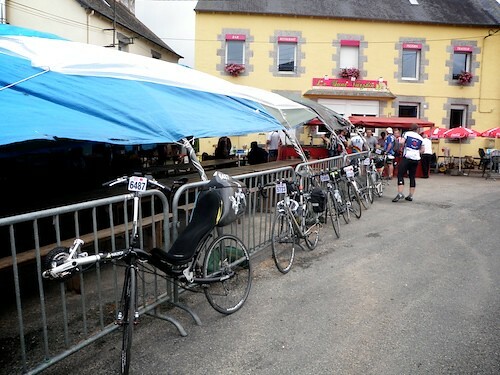 For whatever reason, the Gaucho proved better in this respect than my own Raptobike and so it was, against all expectations, that I found myself at the start line of the world’s greatest amateur cycling event on a borrowed bike. We can only salute the generosity (foolishness? madness?) of David Gardiner at Laid Back Bikes that he would send a new demo bike across 1200km of northern France! If the speed of the bike were in any doubt, hilly sections averaging 17-18mph after 900km in the saddle put paid to that. In the end, it wasn’t as good as a knee replacement but it did make a big impression on me. For the first time I came to understand the perspective of the high-racer advocates, that although a bike design may be in a strict sense slower (than a lowracer), it doesn’t matter – may even be preferable – in the context of the type of road and event that is being ridden. If you’re in the market for a great all-rounder, the Gaucho 28 has to be worth a look. It just so happens there is one in Edinburgh ready to be demoed! Thanks for this review, Dave, very informative and a joy to read. Incidentally, not long ago someone showed up on the German Liegeradforum who was not happy with this model at all. Complained about weight, finish, performance … which caused me to wonder, as I’ve heard so far only good things about Nazca. Okay, nobody ever made the claim their models being super-light, but other than that everyone seemed to be content. So it’s good you’re putting things in order again. 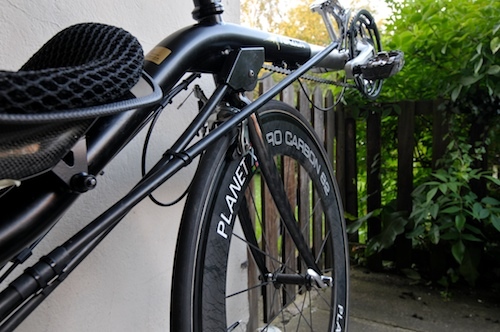 A bike that enables you to do PBP in time and without discomfort can’t be that bad, esp. regarding the fact you had only a very limited riding time on it before. Congratulations and big thumbs up for your PBP ride! Every participant is a winner in my eyes. The Nazca bikes (well, I’m thinking of the Fuego in particular) go down rather well here. As you say, they are not super light, but then you know that before you buy one – and you don’t have to pay for it either. I’ve just started reading your reviews and would add to all the praise they have had – they are indeed a pleasure to read and very informative. Thank you! Just thinking on the Gaucho: has anyone thought to remove the shock and put in a rigid bar drilled to give different ride heights/ seat angles? Would be an interesting test. What’s your view on the Fujin SL as a fast tourer and lightweight climber (I spend a lot of time in the Pyrenees). Thanks again – great job. Fujin SL is another bike that’s worth a look. Reviewed elsewhere by Mr McCraw. The stock seat is SL aluminium though which may not suit all riders. One thing about the carbon or GF seat as they can be more comfortable. Challenge’s standard seat gives a bit more width and space. Seat angle is set on Fujin quite low. Nazca is more upright and has frame and seat angle adjust like the Fuego. If you do go lower with a Fujin then smallest Radical bags and a rack bag will fit. Descending on a low racer feels fun and faster maybe? Climbing I’m not sure. Check your x-height and then ask a dealer is my advice. Thanks as always for your excellent reviews Dave. I am currently exploring getting into recumbents (two wheeled and a velomobile, a Sinner Bikes Mango) and the cost means I am searching for a multi-purpose bike. Reading your review the Gaucho 28 appeals from a fast commuting perspective (42 km each way) and from an Audax purpose but I would be keen on being able to use it touring as well. What are you thoughts on the touring aspect? I do like to explore dirt roads so being able to run 35 mm to 40 mm tyres would be nice as would being able to fit a rack. I can and do pull an Extrawheel Voyager trailer so just a rack on the bike should be sufficient? I have read your Gaucho 26″ as well but got the impression that the 26″ is quite a bit slower. Fair comment? Thoughts? I am also by the way considering a MetaBikes MetaPhrastic which maybe a better option. I saw you posted up a couple of articles on reddit – thanks! I would definitely recommend you look at the Metabikes range. I’ve actually kind of stalled on a review of this frameset for the last few months (other priorities) but it is a very flexible offering. For tarmac, I think the Gaucho and High Baron are strong contenders but neither would work off-road, at all. 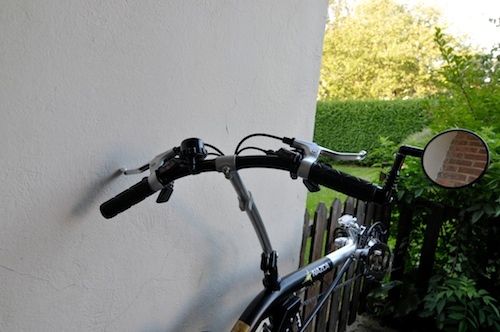 The Metabike on the other hand is apparently quite capable off road. I find it handles a little too sharply for comfort on tarmac, and haven’t had a chance to take a demo bike onto dirt to see what would happen (make a mess of a nice shop frame!). Would love to see that review When you refer to the handling, do you think this would be an issue for a new recumbent rider or can you expand on what you mean by “too sharply”. I must admit that I do keep coming back to the Meta Bikes MetaPhrastic. Nothing else seems to do what it can do. There is only one frame across the Metabike range. My theory is that the geometry is designed around the use of 700c wheels in conventional rim-braked forks, so when you have a 700c disk wheel (as I’ve demoed) the longer suspension-corrected fork changes the head tube angle and makes the steering a little twitchy. I’ve also tried a 559 disk-braked version and thought it was better (perhaps because the fork wasn’t suspension corrected, this is one of the things I need to follow up on for my review). The Meta wheelbase is also quite short which makes the bike lively versus something stretched out like the Baron. To an extent this is a question of taste. At the end of the day lots of people are getting into Metabikes and seem to love them, so I wouldn’t be too worried. 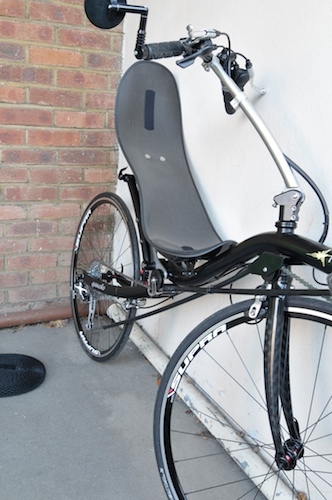 The seat is high for a first recumbent but that should be no obstacle to a keen beginner! Thanks for your further comments. Much appreciated. One of the things I like about the MetaPhrastic configuration is the flexibility in wheel size choice. One option that was raised over at Bentrider Online was to run 622 (700c) on the rear and 559 (26″) on the front as it is suggested it enhances the handling. Anyway the ability to try different setups is there. On the subject of the geometry there has been some recent discussion of this again at BROL. I rode a metaphrastic on ratrace london to edinburgh. See http://www.laid-back-bikes.co.uk/page26/page26.html . I agree with Dave it was more twitchy than my usual low racers however the higher position was an advantage in London traffic. Chainline was very simple and I had no mechanical issues which was a relief. The disk brakes were very welcome and I think it would be interesting to try with more knobbly tyres on rougher ground – no suspension here though – but it would offer great flexibility. How much does a midracer weigh in lbs? I assume you rode PBP with standard seat angle setup (26-34 degrees). As you know Nazca is offering also 21-29 degrees setup. Which one you would choose for “multi-purpose-commuter”? I am going to buy my first recumbent soon, and I am thinking between these two different setups. I rode with fuego last week with seat adjusted to 26 degrees and it did not feel too laid back. I am just wondering, in which situations one would need the 34 degrees seat angle. Teemu, I would definitely go for the lower option I think. 29 degrees is still quite upright and you may be quite thankful for the ability to go flatter, which gives a nice boost once you’re used to it. Also – you can always add a couple of degrees with foam under the mat if you want to, but you can’t make the seat any flatter..
Thank’s Dave. I had similar thoughs. I will follow your advise and buy the lower option. The tip of using foam is also great.